C. F. Martin 0-42 Model Flat Top Acoustic Guitar (1927), made in Nazareth, PA, serial # 33279, natural lacquer finish, spruce top, Brazillian rosewood back and sides, mahogany neck, ebony fingerboard, black hard shell case. The pearl-trimmed, 12-fret Martins of the 1920s are some of the great wonders of the 20th century 6-string world, at once opulent and austere. Notwithstanding the finely wrought pearl bordering to the top, this 0-42 remains at its heart a musical instrument built for sound. The company lavished their finest materials and workmanship on their highest grade Style 42 and 45 instruments, not relying on just decorative elements. This Style 42 is built with superb straight-grained Brazilian rosewood for the back and sides, the tightest-grained Appalachian spruce for the top, and extravagant blue, green and pinkish hued abalone for the border inlay. At the time this guitar was built, they were officially being made for gut stringing but many players were requesting steel; this guitar is lightly X-braced but has no problem with silk-and-steel stringing and sounds wonderful in that mode. The size 0 was by this point the smallest of the models Martin offered at the top quality level, and is a very rare guitar. This 1924 0-42 is one of just 39 made that year, which was actually the highest production of the model up to that point. This lovely pearl of a guitar originally sold that year for $105.00, which seems like an amazing bargain even calculated in period money! Many of the fancy tenor banjos of that era sold for several times that price. Pearl-trimmed Martins were never made in large batches, and it would be very unusual for any but the largest dealer to order more than one at a time, or even to hold one in stock. Mostly they were built to order, and even in the opulent 1920s there were not a lot of guitar players that could afford one! 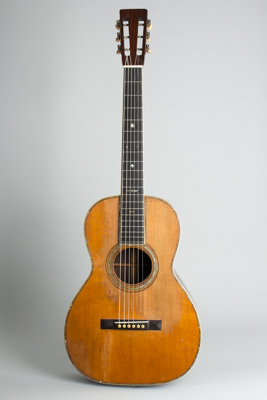 This 0-42 has seen a tremendous amount of use over the last nearly 100 years of use but remains a wonderful sounding instrument, a testament to its builder's skill and reputation and as fine a 12-fret 0-sized model as could be made. Overall length is 38 in. (96.5 cm. ), 13 5/8 in. (34.6 cm.) wide at lower bout, and 4 1/4 in. (10.8 cm.) in depth at side, taken at the end block. Scale length is 24 3/4 in. (629 mm.). Width of nut is 1 7/8 in. (48 mm.). This old Martin is quite heavily played and beautifully worn in, but still largely original with a number of old repairs but no major structural alterations. Most notably, it has been PLAYED for decades, and played hard. The top finish is worn through to the wood in a decent percentage of the total, including the entire area under the fingerboard and soundhole back to the bridge and spots beyond. There is extensive finish wear over the entire guitar, but no major overspray and only small areas of touch-up. This guitar never had a pickguard but probably should have-There is wear into the wood below the soundhole and portions of its edge have been worn away from picking. There are some crack repairs, which is no surprise on a guitar this well traveled. The most notable is a spruce grain split to the top behind the bass area of the bridge that has been sealed not as cleanly as we might prefer with some topical touch up. The cleats beneath are neatly done anyway, but it is quite visible. There is a long split to the bass side running along most of its length; this was sealed up probably long ago with some finish disturbance on the outside, a couple small maple internal patches and a decent amount of old hide glue spread on the inside. The back has one sealed grain crack just off the canter on the rear edge, relatively inconspicuous. The pyramid bridge is a nice replica with a slightly canted bone saddle and a some lower top than the original. The original very thin maple bridgeplate is intact and unaltered, but does show a couple of small old holes on the ends where the original bridge must have at one point been screwed down. The original light scalloped bracing is unaltered as well, and in general the inside of the guitar is much neater than the outside. The original bar frets have been taken quite low; the guitar is still well playable but someone preferring a higher fret would want to replace them, which can be done. The very dense ebony fingerboard shows some divoting in the lower positions but less wear than one might expect. This guitar is a well-scarred veteran of many musical eras, and much of its history is lost. For a number of decades now it has been in the possession of a lady who was a professional folk artist in the 1960's, who chose this model in part because of its resemblance to Joan Baez' famous 0-45. It is a testament to the quality that Martin built into these guitars that even after lifetimes of heavy use they are still fantastic musical instruments with stories still to tell. Overall Very Good + Condition.